Crescent’s 170-Piece Mechanics tool set contains a carefully selected assortment of Crescent brand hand tools needed for most industrial, mechanical, and consumer applications. The set includes 1/4-inch, 3/8-inch, and 1/2-inch quick release ratcheting drives with a wide selection of standard and deep sockets in the most common SAE and metric sizes. Included in the set are the following 3/8-inch drive tools: a 72-tooth quick-release ratchet drive, 2 extensions, a 3/8-inch to 1/4-inch adapter, 2 spark plug sockets, 25 twelve point sockets and 10 six point deep sockets (SAE and metric). 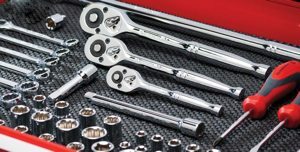 It also includes the following 1/4-inch drive tools: a 72-tooth quick-release ratchet drive, a 3-inch extension, 22 six-point sockets (SAE and metric). Additionally, there are 12 SAE and metric combination wrenches, 2 pliers, 8-inch adjustable wrench, 4 screwdrivers, a magnetic bit driver with 44 driver bits, and 26 SAE and metric hex keys. All tools in this industrial quality tool set meet stringent new ANSI and ASME specifications and come with a full satisfaction guarantee. From the flawless chrome finish of its wrenches, ratchets, and sockets to the perfectly balanced and shaped dual-material handles of its screwdrivers, this Crescent 170-piece mechanics tool set (model CTK170CMP) offers an extraordinarily high level of quality. Crescent mechanics tools are made from chrome vanadium steel alloy, specially formulated and heat-treated for high strength and superior resistance to abrasion and corrosion. Every part of every tool — from the vapor-blasted screwdriver tips to the hardened ratchet gears and pawls — is designed for extremely long life. The CTK170CMP set contains all the tools needed for most industrial applications including 1/4″, 3/8″ and 1/2″ quick-release ratchets, with a wide selection of standard and deep sockets in the most common SAE and Metric sizes. All tools meet stringent new ANSI and ASME speci?cations. Celebrating its 100th anniversary in 2007, the Crescent brand adjustable wrench is the flagship tool and a true American icon. It is prized by tradesmen and homeowners alike for its utility and durability. Today, Crescent offers many other high quality tools, including tongue and grove pliers, locking pliers, screwdrivers, and nutdrivers.